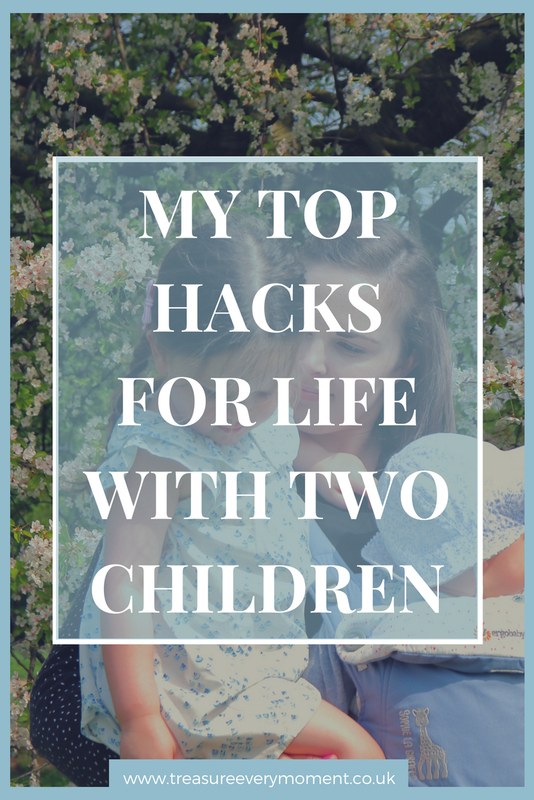 Life with two children is certainly busy, hard and hectic at times, but with these hacks I've found they made life easier. We are now well into life with two and I can't imagine what it would be like to go back to only having one child. As soon as you have multiple children your attention, time and focus is stretched, torn and demanded at almost all points of the day. There never seems to be enough time in the day, everyone seems to want/need your attention together and I've found that organisation is key. It can feel relentless at times, but since returning to work after our second daughter we have to stay on top of everything other it all falls apart, resulting in unnecessary stress. I thought I'd share below some of my top parenting hacks that have honestly made life so much easier since having two children. For reference, Isabella is three years old and Poppy is 1 years old. Fill the freezer with healthy snacks/puddings - Ice lollies aren't just a summer 'treat' in our house; it can be freezing outside and Isabella will still request one. This is why our freezer is filled all year round with homemade ice lollies and I'm happy for the girls to enjoy them as they're a healthy option. Now that Isabella's that bit older she really enjoys making herself and Poppy a batch of ice lollies using leftover smoothie or fruit juice. If you really want to pack them with vitamins, nutrients and anti-oxidents then you could make freshly squeezed juice using a juicer uk. They're ideal if you're lucky enough to stumble across a whole lot of reduced fresh fruit in the supermarket and you're not sure what to do with it. An affordable, healthy and nutritious snack for children and adults alike. I find keeping the freezer filled means that they can not only be used as an incentive for the girls, but also solve any 'the cupboards are bare' situations. Encourage independence in your eldest child - Isabella was just over two years old when Poppy was born and we had started encouraging her independence during my pregnancy. This was partially to prepare her for becoming a big sister, but also because my rather large bump meant she really needed to be able to put her own shoes on etc. Isabella can now get herself dressed, undressed (except anything with buttons on), go to the toilet herself, wash her hands, get the plates/cutlery/cups out for meal times etc., all of which really help our day run smoothly. Not to mention how much she craves that independence and the positive feedback she gets from us when she does these things by herself. You can see how proud she is of herself and it means that I'm able to keep a closer eye on Poppy. Teach your eldest child to recognise what the younger one can/can't have - Teaching your eldest to know how big objects have to be to be suitable for your youngest child makes your life a lot easier. Now, clearly they can't be and certainly shouldn't be responsible for ensuring the little one doesn't put anything small in their mouth, but it helps to have a spare pair of eyes watching out. It's important to explain why they can't have little things, so that they understand why you're asking them to 'keep an eye out'. Separate small toys - This one links closely with the tip above, as keeping all small/choking hazard toys separate makes play time a lot easier. Isabella has a Mini Thunderbolt Toy Storage Bag from Play&Go that we keep all the small accessories, dolls and toys that Poppy can't play with yet. That way it is a special treat to have them out while Poppy naps and it ensures there is no risk of Poppy picking up anything that could pose as a choking risk. Sync their nap times - Now, this is easier said than done but if you can sync nap times then this gives you a true break. In those first months of having two children life can be hectic as newborns typically don't sleep anywhere but on someone and then there's the constant feeding, burping and nappy changes to contend with. But by the time your youngest one is around a year old there is hope that you might just be able to coincide their naps, giving you a much needed break. At the moment Poppy has a morning nap and then they both have an afternoon nap at the same time. Isabella is getting to the age where she is starting to drop her nap, but after three days at nursery she is usually exhausted and more than happy to have a rest. Find toys that appeal to both children - As both girls are young we are certainly not in the height of arguing over toys etc., but already I've found it so much easier to put out toys that appeal to both of them. It keeps them both entertained, minimises mess and prevents arguments. Some of our current favourites are duplo, wooden blocks, a giggle ball, princess castle tent, touchy feely books, balls, anything musical and the wooden ice-creams. Have a selection of 'big girl/boy' toys and games - It can be frustrating for the older child when they aren't allowed to play with toys because they have small pieces in, so to minimise this we have 'big girl' time when Poppy naps in the morning. As soon as she's asleep we'll get out an Orchard Toys games, her toys with smaller pieces or activities linked to numbers/letters/writing. It's our precious time together and means that Isabella isn't missing out on playing some of her favourite activities. I also found Orchard Toys games essential while breastfeeding Poppy as a little baby because I could play them one handed on the sofa while feeding. Prepare fruit/vegetable snacks for a few days at a time - As parents we aim to provide our children with a healthy varied diet, but when it feels like you're spinning a lot of plates cutting up endless fruit and vegetables probably isn't on our agenda. To help ease the time spent preparing healthy food each day I like to buy fruit/vegetables that I can chop up and use over a few days. Our favourites are carrot sticks, cucumber, melon, pineapple, mango, grapes, blueberries and red pepper. Batch cook healthy meals and freeze them - To help ease the pressure at meal times, yet still ensuring the girls are getting healthy meals I will cook in batch around once a month and then stock up the freezer. That means that all I have to remember to do each day or the night before is get a meal out of the freezer to let it defrost. We use metal takeaway style containers from Wilkinsons, so that we the meals are just the right portion sizes. Take snacks everywhere - This goes without saying really, but wherever you're going at whatever time make sure you have all the snacks with you. I find it helpful to have 'baby friendly' snacks for Poppy and more grown up snacks for Isabella, so that they don't spend the whole time trying to eat each others. Set up 'help yourself' stations around the house - I'd say this is probably the most useful tip I have, though it is dependent on the age of your eldest child. We have lots of different 'help yourself' stations for Isabella to access as and when is needed, which not only supports her independence but also makes my life easier too. We have a box by the front door filled with hats, sunglasses etc. in the summer and woolly hats, scarves etc. in the winter for her to help herself. There is a tub with spare pants downstairs in case she has an accident and needs changing. On nursery days we set out her clothes the night before, so that she can get herself dressed in the morning. All of the child plastic plates, bowls, cups and cutlery are in a kitchen cupboard she can reach. Get yourself ready first in the morning - While the children are playing, get yourself ready and then get them ready. I've found this works best for a number of reasons, mainly being that they don't get bored and start asking again and again when it's time for breakfast! Another reason is because they are less likely to make a mess of their outfit for the day due to dribble, sick, accidents etc. Do their teeth in the bath or cot - If your children are anything like mine then doing their teeth can become a bit of a negotiating task. It's not that Isabella doesn't like doing her teeth, it's that she doesn't like me doing them first. Also Poppy will often try and escape while I'm brushing Isabella's teeth, which all in all can become quite stressful. I've found that it is so much easier to do their teeth while they're in the bath or cot simply because they can't escape! That way Isabella and Poppy always seems to do them nicely, probably because they realise there's nowhere to go. What are your top hacks that make life easier? Some great advice her - I especially love the one about teaching independence in your eldest which I imagine would be key. My boys are four years apart, almost to the day, and finding toys and activities that appeal to both has definitely been one of the most challenging things. The 'help yourself' stations are a great tip, I'll have to try and incorporate some of those. This is such a brilliant list! I hadn't realised how many of these I did, but in the early days of two I had stations around the house, we had specific toys that helped, favourite snacks always stocked up. I never managed to sync their naps though as Ellie decided that was enough napping when Trix was about 6 weeks old. These are some seriously great tips. I'm just about to become a mum of two and I have been wondering how on Earth I am going to cope. I love the tip about separating the small toys and accessories and also the help yourself stations. There are some great tips there. I know the jump from one child to two can be quite a big one so making life easier is key. Adding more kids to two is much easier! Great tips! As a mummy of five I found the biggest jump was going from three to four! That was a game changer! I I agree with all these tips. Having healthy snacks is so important. Great tips especially the one about 'help yourself' stations. Home made fresh fruit ice lollies have always been a popular choice in our house and I always try to have healthy snack options available for when we're out and about. All great ideas and tips. Some of these we are still doing now. Batch cooking is something we do because of my wife's health. It helps the family more, know we have a meal ready in the freezer and not always asking. WHATS FOR TEA/Dinner?